Glimpse, the creative collective that a year ago replaced all the advertising in Clapham Common station with cat posters, has launched a pop-up shop with charity Help Refugees that aims to redefine the meaning of festive consumerism. 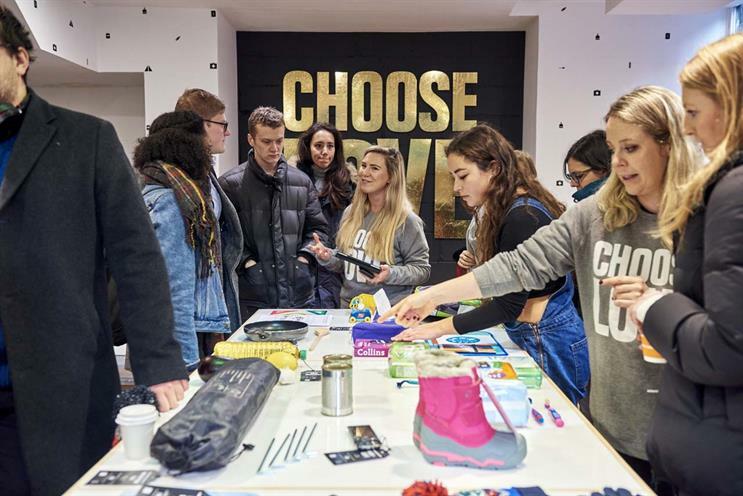 The project, Choose Love, invites visitors to the retail unit in Soho to buy products that will be distributed across Europe and the Middle East by Help Refugees. The items on sale include basic necessities like blankets, nappies and cooking ingredients, as well as some items that symbolise services: you can buy tissues for example, with the money actually being used to find counselling and other psychosocial services. They are divided into three sections, which follow the journey of refugees: Arrival (emergency items like warm clothing and food), Shelter (tents, sleeping bags and hygiene packs) and The Future (items such as school materials and the keys to a home). Zac Schwarz, co-founder of Glimpse, said that as well as providing an engaging way to contribute money towards helping refugees, the shop was about using a surprising context to make it easier for people in the UK to empathise with the difficulties they faced. Wouldn't it be great to reclaim Black Friday as the day everyone buys for someone else who really needs it? It could still be a positive consumer story. "One of the interesting things was what imagery to show," Schwarz said. "We found that a lot of the imagery [of refugees] is not connecting with people any more. It’s very horrific and quite moving, but people are distancing themselves from it." Instead, the windows of the shop feature high-quality, flat-lay photographs of the basic items sold inside that are reminiscent of many of the photos on Instagram. The idea, Schwarz said, was to use the "language of retail" but replace high-end, aspirational products with these fundamental basics to reflect their significance for people who don’t have easy access to them. "Showing that these are people just like you and me, who just need warmth and love, is crucial, rather than trying to shock people into feeling guilty," he added. The shop launched on Black Friday, offering a counterpoint to the day of relentless shopping. Schwarz’s fellow co-founder, James Turner, said it was to some extent trying to do for retail what Glimpse’s previous project, the Citizens Advertising Takeover Service, in which it crowdfunded £23,000 to buy all the posters in Clapham Common station for two weeks, had done for advertising. "CATS was about helping people recognise that buying products isn’t the route to happiness, and that relationships, experiences, all these intangible things, are really what leads to fulfillment," Turner said. "So we thought for Black Friday, what about a retail experience that is turned upside down, where you couldn’t buy anything for yourself, so you get away from that individualism, that sense that the next product is going to make you happy." Schwarz added: "There’s also a sweet irony that we’re about 200 metres from Amazon, who have opened their Black Friday pop up shop as well. "We thought, wouldn't it be great if we could reclaim Black Friday as the day before Christmas where everyone buys for someone else who really needs it? It could still be a positive business story, a positive consumer story." Around 60 people have contributed their work to Choose Love, while Glimpse now has more than 2,000 people from the creative industries on their mailing list. While this is only the group’s second project, it is about to step things up a notch; Turner has recently left his job at The Syria Campaign to focus on Glimpse full-time. While it will continue to do pro bono projects such as Choose Love, Turner and Schwartz also plan to do paid work for organisations that want to facilitate their staff using creativity for good. "We want to find a way for people in the creative industries to harness their personal passions and bring it into their work," Schwarz said. "In our experience, people feel there’s something missing sometimes in their work." They plan to offer a "creative training", Turner said, "where you go into an organisation and talk to their staff about the issues that matter most to them. That might be plastic waste in the ocean, gender inequality, or something as simple as being too busy and not having enough time with your kids. We’re very conscious of every idea being allowed to go wherever it wants to go. "Based on those insights we develop a creative idea which may or may not have anything to do with the core business – they can then develop that themselves or take it to a client." The amount of work contributed by volunteers for Choose Love, which has been put together entirely in the last two months, has "just been phenomenal", Turner added. "Whenever we’ve needed a designer, director, graphic artist, they’ve popped up – if you can marry that sense of meaningful work with the existing professional skills people have the results can be really impressive." CATS and Choose Love are also linked by a theme of challenging the assumptions of commercialism, the two founders stressed that this was not in any way central to what Glimpse was planned to be about. "We’re very conscious of every idea being allowed to go wherever it wants to go," Schwarz said. "Each time we’re going to do something different and hopefully attract different people to the collective." The Choose Love shop is at 18 Broadwick Street, Soho, London, W1F 8HS. Those unable to visit the store can also shop online at choose.love.